We are a small family business who work hard to find our customers just the right Dolls, Toys and Games. We special order and custom make, so never hesitate to ask! Our games,toys and dolls are old school....use your hands, brains, get outside, play with friends and family. Our girls...Katy, Jamie and Maggie are happy to play new games with you or try out the latest toys. We open and play with everything that comes into our store! 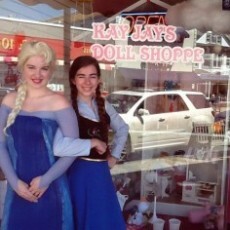 Anna and Elsa are available to visit your upcoming birthday party! Contact us for information!